I've been taking more walks around the neighborhood in the last weeks. 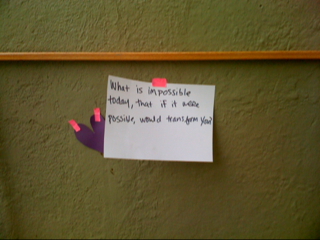 Kit and I walked to a holiday fair one day, and saw the above sign: "What is impossible today, that if it were possible, would transform you?" Heavy. We also enjoyed seeing some homemade bag dispensers made of cut up plastic milk jugs, nailed to trees, with signs encouraging people to pick up after their dogs. Walking around my own block, I was accosted by a tallish woman with a wobbly walk, wearing a North Face puffer vest. As I passed her, she said "Eat sh*t and die and stay out of my f$#ing forcefield. Karma will get you with a big fine." 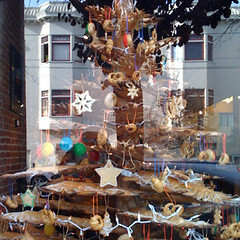 On a happier note, Thorough Bread has a holiday bread tree up. 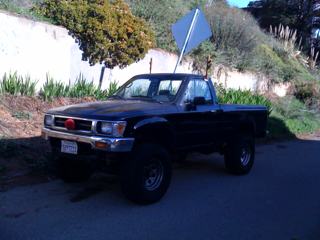 And someone Rudolphed their jacked up truck. 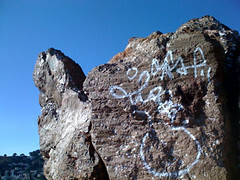 And I climbed Randal Rock. We had another Oregon Thanksgiving this year. Unsurprisingly, it was rainy and gray, but it was nice to see the fam. We finally saw Brittany and Michael's new house, which is charming and comfortable. 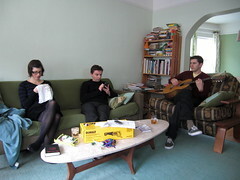 Brittany needlepointed, Jason Blackberried, and Michael strummed. Lacking a conversation partner, I attempted to learn to crochet. Michael's mom hosted dinner this year, and it was tasty. 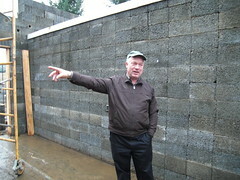 Dad's been making lots of progress on his house. The first floor is now taking form. 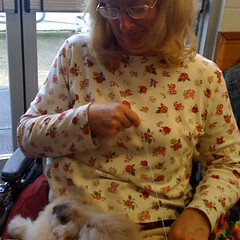 Mom and I went to a local craft fair, and saw a woman spinning soft rabbit fur (not directly from the rabbit though). She also makes cat and dog yarn.